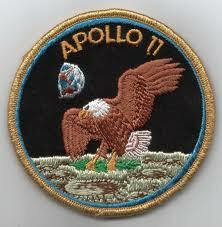 This iconic embroidered image commemerates mans first walk on the moon. Yuri Gagarian’s sub-orbital flight in 1961 to present day multi-national crews logging months of flight on the International Space Station, many missions to outer space have featured uniquely designed embroidered patches for the astronaut’s uniforms and apparel worn by members of the support crews. Soviet Cosmonaut Valentina Tereshkova, flying the Vostok 6 mission, set a world record 50 years ago by becoming the first woman in space. But her gender wasn’t the only contribution that Tereshkova made to the cultural history of space exploration — she was also the first person to wear a mission emblem on her spacesuit, although it was hidden from view. 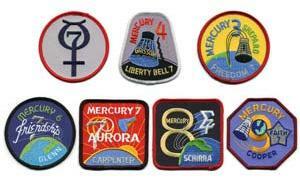 These are some of the earliest US space flight patches from Project Mercury. In the early days of U.S. space missions, astronauts were allowed to name their spacecraft, i.e. John Glenn’s Freedom 7, and these names, used as radio call signs to avoid confusion, especially during the Gemini missions when multiple spacecraft were orbiting the earth, invariably found their way on to the mission’s commemorative embroidered patch. Patches from these early missions, often limited in number, are highly prized by embroidered patch enthusiasts and collectors. 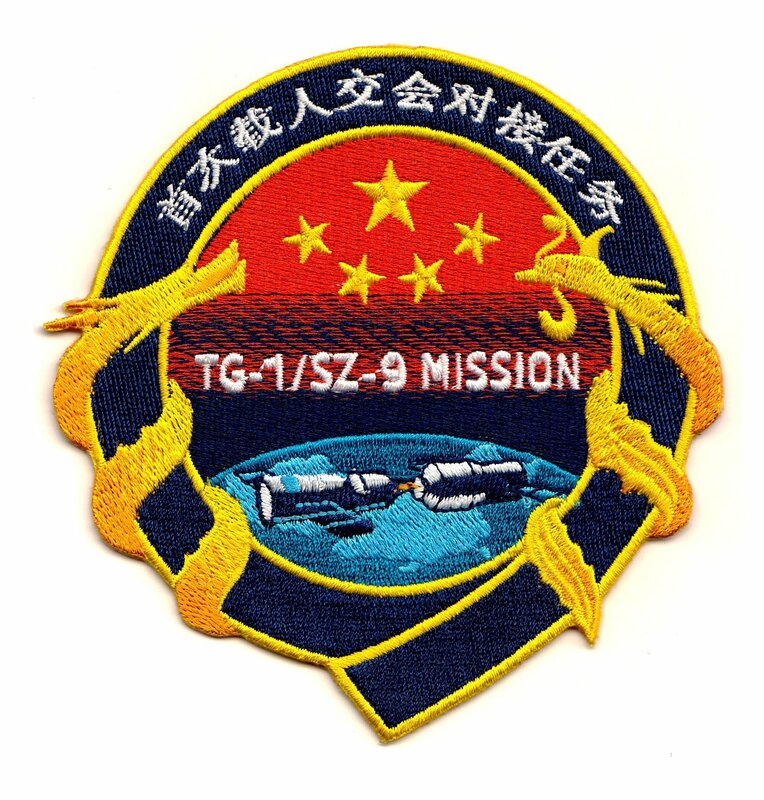 With the advent of the Space Shuttle and multiple missions to the International Space Station, often in the same calendar year, the reuse of the spacecraft led to a system of numbering missions. These numeric designations also found their way on to embroidered patches. Even with the larger crews used for the space shuttle, the last names of each crew member are featured on the patch. Space shuttle mission patches feature the names of each of the crew members and some spectacular embroidered artwork. At the new space shuttle museum/display at Cape Canveral, an entire wall is dedicated to embroidered patches, including the official mission emblems for all 135 shuttle flights. An 8-inch emblem, specially created for the exhibit by artist Tim Gagnon, honors all 33 of Atlantis’ missions. Featuring the Space Shuttle Atlantis logo at its bottom, includes “iconic scenes and payloads” associated with the retired orbiter’s 26-year history, and includes 33 stars and 10 international flags representing each of Atlantis’ missions and the countries represented by its crew members. 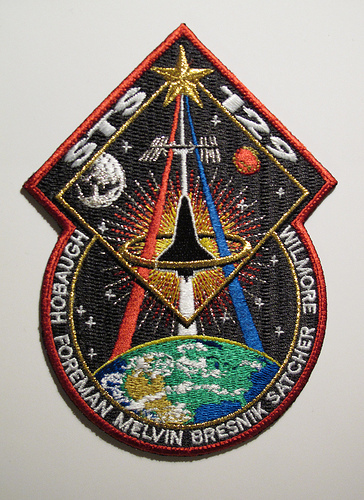 But you don’t have to go to outer space to have custom embroidered emblems; learn more about creating a unique patch for your group or organization, visit the Chicago Embroidery Company at www.c-emblem.com , email us at sales@c-emblem.com , or call 312/664-4232. This entry was posted in Uncategorized and tagged Apollo 11, embroidered patch, embroidered patches, Project Appolo, Project Gemini, Project Mercury, shuttle, space, space flight patches, space patches, space shuttle by The Chicago Embroidery Company. Bookmark the permalink.